We can happily say that Bagsy has now successfully launched in 35 Debenhams and they look fantastic! After many months it’s finally great to see the final product in all its glory and we can’t wait for you to see it too. Making sure as to let the products do the talking, D4R have created a fun, feminine and unique unit that stands out from the rest and really promotes the products in a great way. 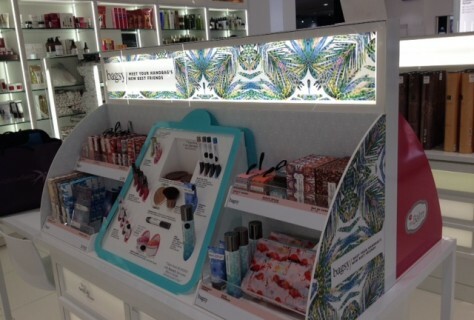 Graphics and the product design is such as strong part of Bagsy so we wanted this to be reflected throughout the unit, we incorporated the products bright and vibrant patterns on the sides and within the signage to create a strong personal identity that will stand out in the store. We also utilised Bagsy’s concept of handbag sized cosmetics by creating a centralised handbag that holds all the testers creating a great focal point, and also so you can see how great the products really are. 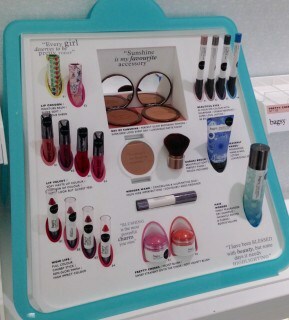 Don’t just take our word for it, when you’re next in Debenhams make sure you check out bagsy in the cosmetic section.